Parliamentarians voted for a drastic increase in fines for defamation on Friday, stoking fears of a bid to silence government critics. The bill, which increases the maximum penalty for defamation to 5 million rubles ($152,888) from the previous limit of 3,000 rubles, was passed in the State Duma by a vote of 231 to 91, Interfax reported. 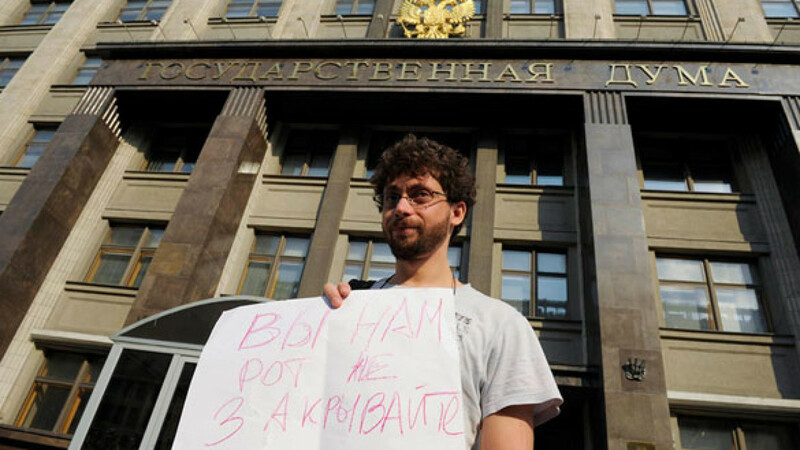 As deputies prepared to vote, a handful of journalists bearing homemade signs conducted one-person demonstrations in support of speech freedoms outside the Duma building. Other protesters criticized what they called a "dictatorial" NGO law, which also passed Friday (Related article: Duma Passes Bill Branding Some NGOs 'Foreign Agents'). The law puts defamation back into the criminal code, after it was taken out by former President Dmitry Medvedev last year. People found guilty under the new rules may also face a maximum of 480 hours' community service, although an earlier plan to introduce jail sentences was dropped. The bill must be passed by the Federation Council and signed by President Vladimir Putin before it becomes law.